The menus will be created by our own gourmet chef, Rajan Mistry. Rajan is a Canadian native with Indian & African roots who grew up in Georgia. 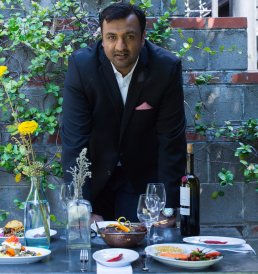 A Georgia State graduate, and a true foodie at heart, Rajan worked in his family’s catering & hospitality operation, while maintaining a career in IT. He always knew that he wanted to take his family’s passion for food and feeding the community and take it to the next level. Today, he is a co-owner at S3 Catering, a catering company that specializes in multicultural cuisine.